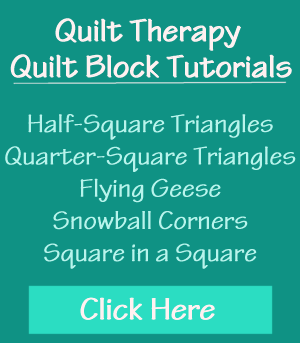 This was the first block of the month (BOM) quilt pattern that I ever designed, and it’s what launched my sister-site, BOMquilts.com. Back when I designed it in 2006, I did it with a different sponsor than the one who’s sponsored my quilts for the past 12 years. And when I released the pattern, she sold out of the kits that she had cut for them. So she cut more kits, and sold out of them. Then she ordered more bolts, made more kits, and once again – she sold out of those kits as fast as she could cut them. She called the secretary of her salesman and literally made her go to their warehouse – all the while keeping her on the phone – in search of more bolts of the fabrics that may have been left on the shelf, got shelved wrong, anything anywhere? Nada. None. Zip. 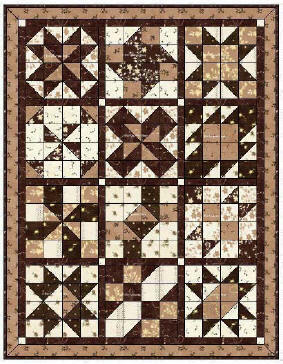 But the story of my Cinnamon-teen Chocolate Figs & Roses quilt design doesn’t end there. I can’t tell you how many times people have sent me their thanks for this quilt design. I even stopped into a quilt shop in a very large city about an hour away from where live and introduced myself to the owners. When one of the sales ladies heard my name, she came over and asked me if I was the one who designed that quilt. When I said I was, she hurried off to the break room and came back with the quilt that she had made using my pattern! Through the years, I’ve had various quilt groups & guilds ask for my permission to make my quilt. 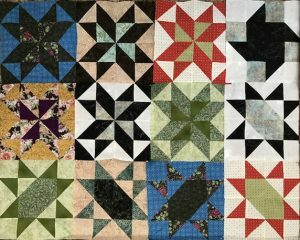 One of the two things I always say is that in order to use my patterns, you must provide me with a photograph of your progress, or your blocks, or your finished quilt tops or your finished quilts. 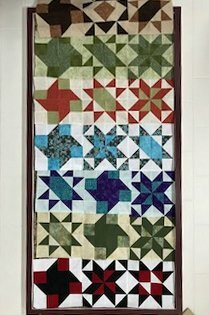 I have never received any photos from quilt group or guild that I granted permission to use my pattern. 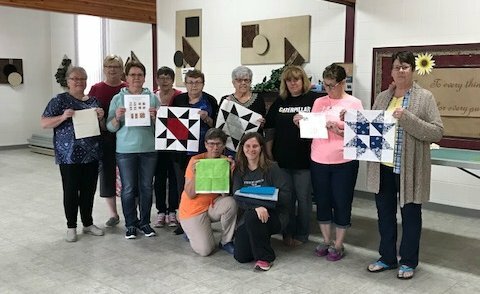 The “Maidstone Quilting Squares” quilt group from Maidstone, Saskatchewan, Canada are making my Cinnamon-teen Chocolate Figs & Roses quilt as a mystery quilt instead of a block of the month quilt. They meet every two weeks in a local church hall. In the winter, they make stone soup for lunch, and everyone brings one item for the soup pot. In the summer months, they do the same with salad. It makes for a delicious and easy lunch and it’s different every time. And no bag lunch this way! Stay tuned for the continuing saga of the “Maidstone Quilting Squares” and my Cinnamon-teen Chocolate Figs & Roses quilt!